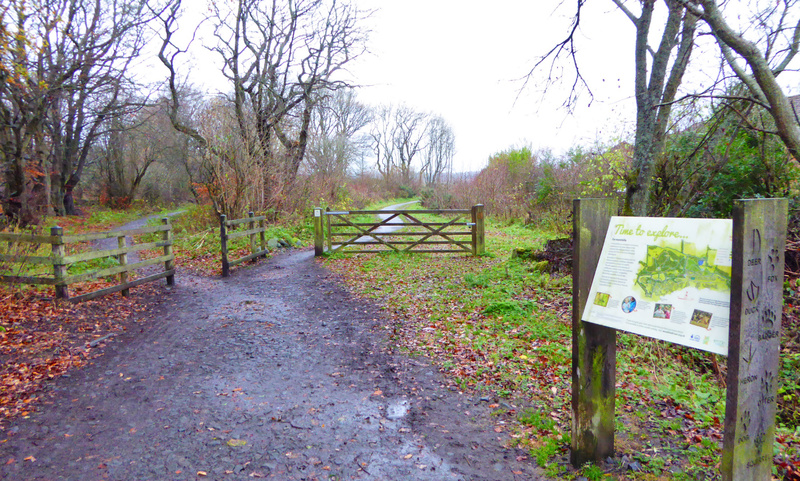 This circular walk takes you into the calm beauty of Coul Den Nature Reserve before winding its way through the well-established new woodland at Formonthills. 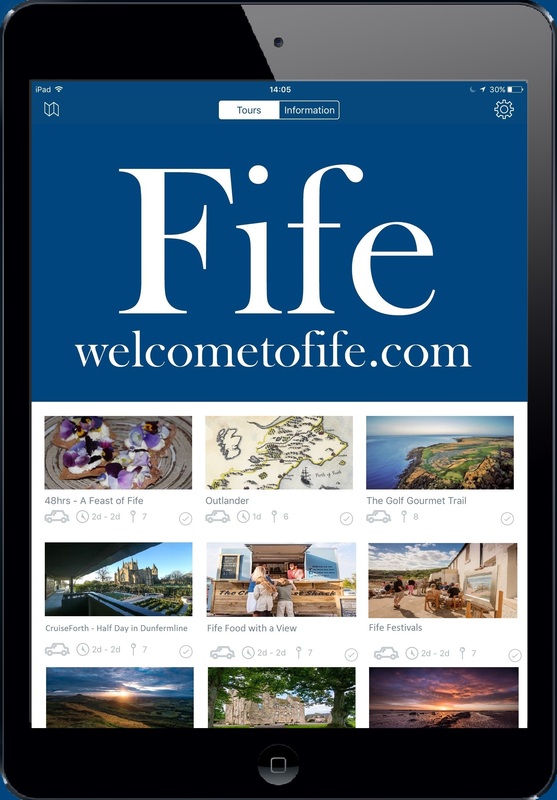 It has some surprising features along the route, plenty of wildlife potential and takes in a gentle hill that, while small, offers superb views across Fife to the Firth of Forth and beyond. Path info: About two thirds of the walk is on surfaced paths. The rest is on grassy paths, most of which are mown but some stretches can be wet or a little muddy, especially in the winter months. There is also an unavoidable flight of 31 steps. Buses: The closest bus stops are the Wilmington Drive stops on Pitcairn Drive, just a 200m walk from the Pitcairn Centre. When you’re standing in the car park, with the Pitcairn Centre and portacabins on your left, you’ll see the recycling bins in front of you. Several paths head off from the car park but you want to take the path that starts just to the right of the recycling bins. 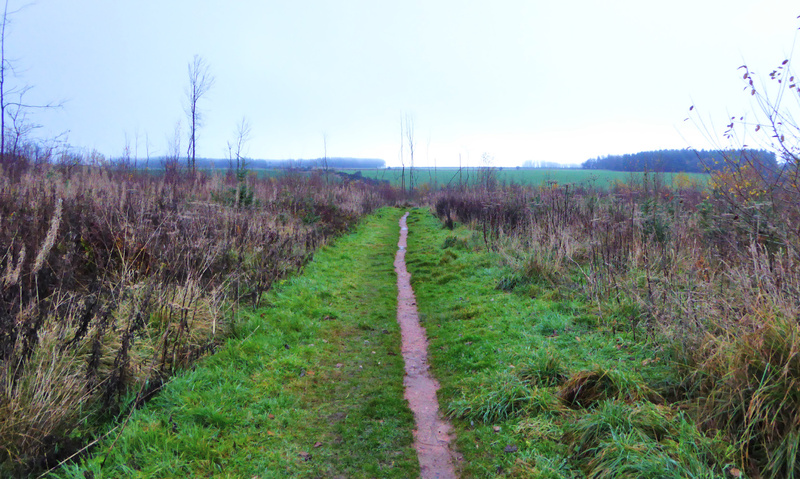 As soon as it leaves the car park the path splits into two. Take the right hand fork, keeping the line of houses on your right. The path eventually bends to the right, at which point you’ll see a metal gate on your left. 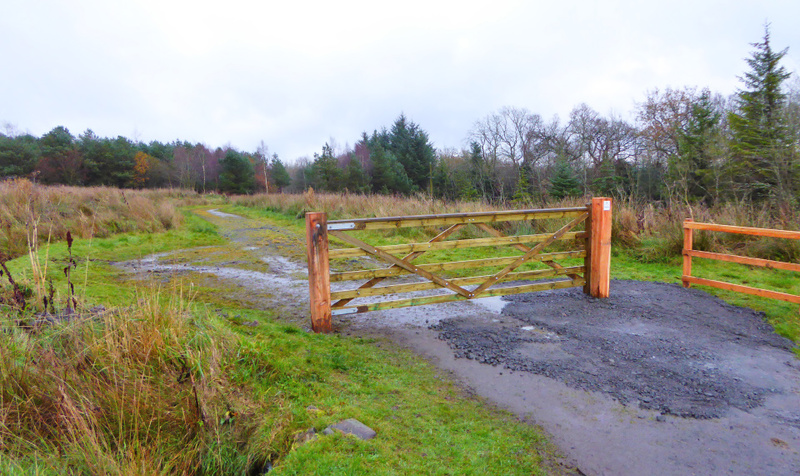 Go through this gate, making sure you close it behind you, and then follow the grassy path through the young woodland. This used to be a conifer plantation but has since been replanted. After 200 metres you’ll see a fence on your left. Ignore the metal gate in the fence and carry on along your path until you reach a grassy t-junction. Turn left at the junction. Five minutes later you’ll reach a gate. Go through this and turn left. You’ll see a car park to your left but you need to walk along its edge until you reach the road and the car park entrance. Turn left into the car park. You will immediately see two paths heading off to your right, either side of the ‘Welcome to Coul Den’ sign. Take the second one (to the left of the Coul Den sign), which heads slightly uphill and follow this to the viewpoint, which is marked by a bench. 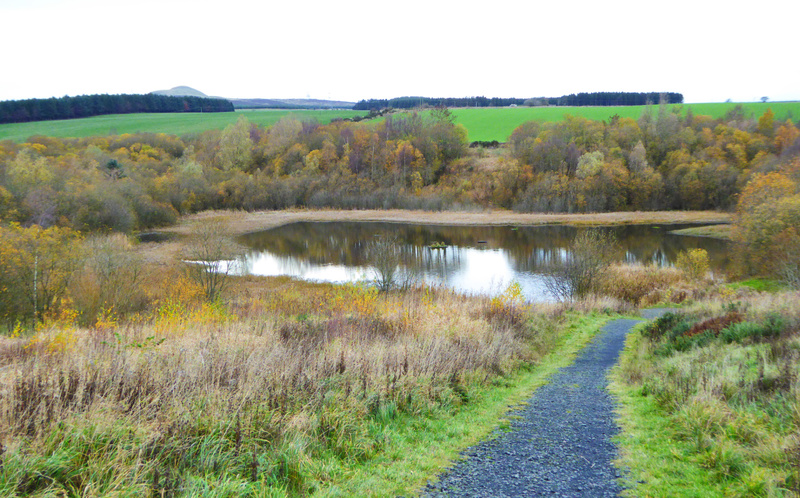 Here you have a nice view down to the loch, which was apparently constructed in 1890 to supply a bottling plant in Markinch. On a clear day, from this lofty position you can see both the Isle of May and the Bass Rock on the horizon. As you stand at the viewpoint and face the loch, one path goes off to your left and another goes off to your right. Take the path to your right. This goes down towards the water before bending sharp right. When you reach another junction turn sharp left, immediately crossing a small concrete bridge. The path now climbs uphill, with a burn to your right. After 200m you cross a metal bridge before the path bends sharply to the left and then immediately crosses back over the burn via another bridge. Not long after the bridges there’s a bench on your left, which gives a nice view back over the loch. 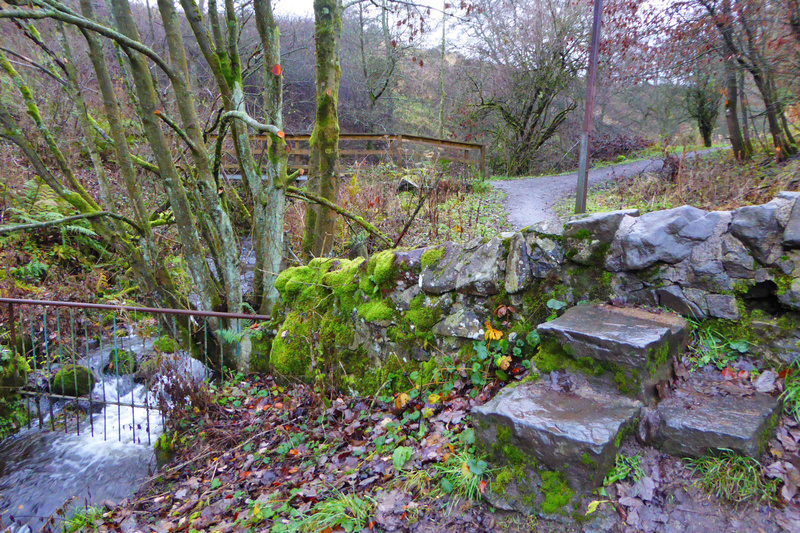 Continue on the path until you reach an old sluice gate across the burn. Cross this, and then 10 metres after that, cross an old stone wall before arriving at a wooden bridge. Turn left over the bridge and climb the zig-zagging steps. At the top of the steps, leave the path you’re on by turning right and climbing uphill via the grassy path, which hopefully isn’t too muddy! At a junction of grassy paths you’ll see a Woodland Trust bench. This is a handy place to take a breather if need be, otherwise turn right and follow the wide grassy path into the pine woodland. 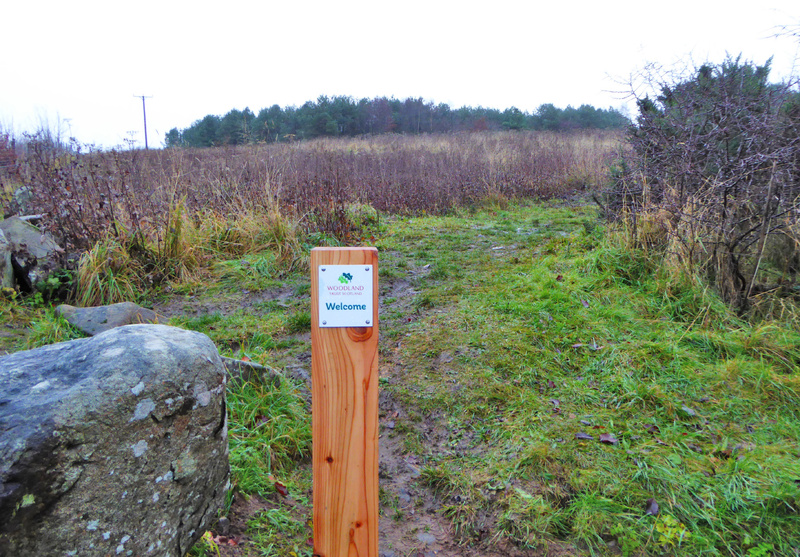 Shortly after another grass path joins from the left you’ll reach another junction, marked by two carved wooden posts. These are ‘slit drums’, each one has a different tone, and kids will delight in the racket they can make by banging them with the attached drumsticks! Turn right at this junction, taking the path that passes through the middle of the two drums. The path eventually bends to the right and a large grassy meadow opens up on your left. Stay on the path until you reach another junction, marked by another carved wooden bench, this time with oak leaves along its length. Ignore the path to your left and continue straight ahead past the bench, passing a red waymarker. When you reach a grove of tall conifer trees (spruce) the path veers left. Another red waymarker should show the way at this point. After 100m you emerge from the trees. 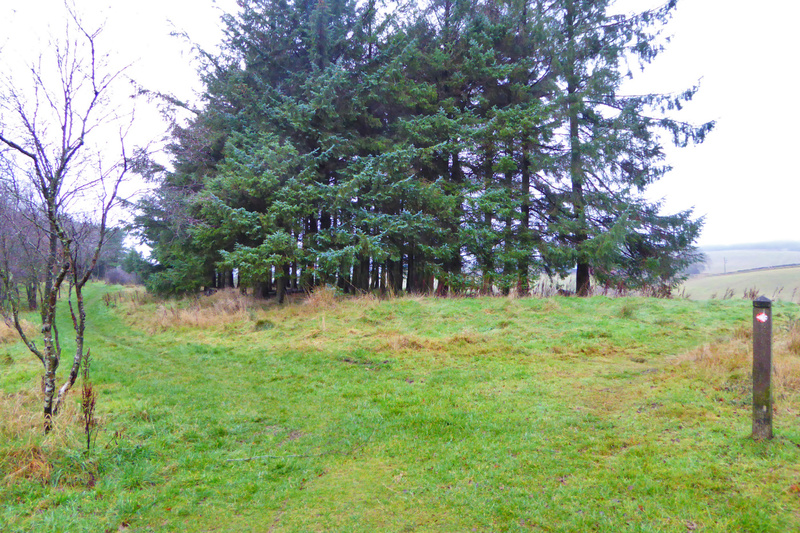 The path runs along the edge of the trees to your left, but you want leave the path and head straight on, up the slope in front of you to the top of Rhind Hill. A few small tracks lead to the top. The summit is marked with a trig point and gives fantastic views in all directions. The nearby Lomond Hills are the most prominent features, but on a clear day you can see across the Forth to Arthur’s Seat and Edinburgh Castle, and even all the way to St Abbs Head in the Scottish Borders, 45 miles away. 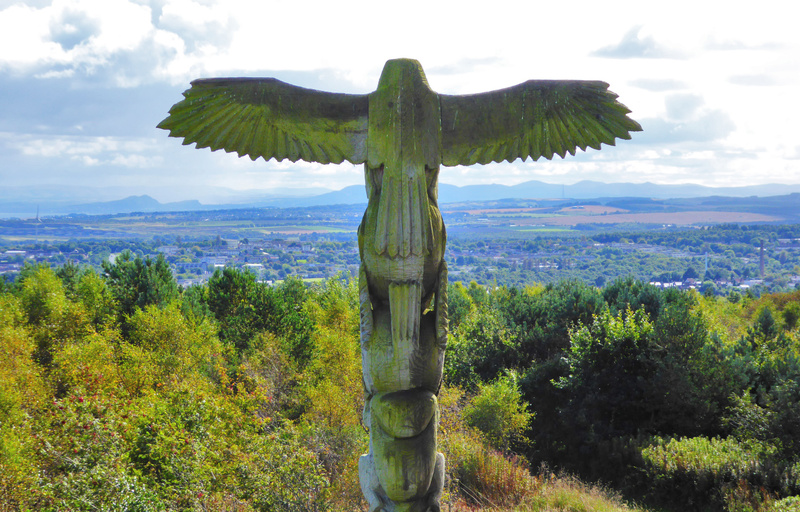 When you’ve had your fill of the view, head in the direction of Glenrothes, towards the edge of the trees, and pay a visit to the totem pole that should now be a short distance in front of you down the slope. This 18ft sculpture, which shows a sequence of Scottish animals capped off with a buzzard, was carved by Kirriemuir artist Alistair Jelks in 2015. There is a junction of grassy paths in front of the totem pole. Go straight over, taking the path that heads off in the direction the totem pole’s animals are facing. 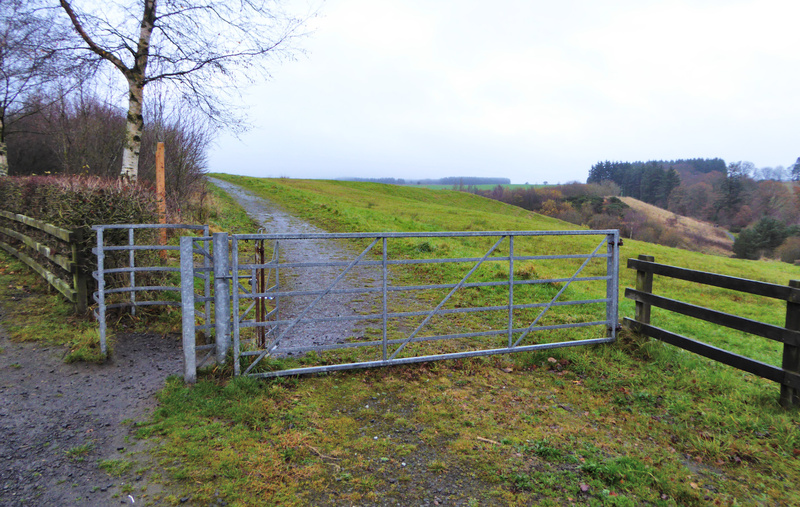 Stay on this path for 0.5km, ignoring any grassy paths that join it, until you reach a road near the main Formonthills car park. Turn right onto the road and then about 20 metres later take the wide path on your left, which is marked by a wooden gate. Stay on this path for about 300m, at which point you reach a junction marked by a seat and a stone cairn, which used to be capped off with a sundial. Go straight on, keeping to the surfaced path as it winds its way along before it goes downhill. Ignore the boardwalk path to your right and instead follow the path you are on as it curves to the left left around the grassy meadow on your left. 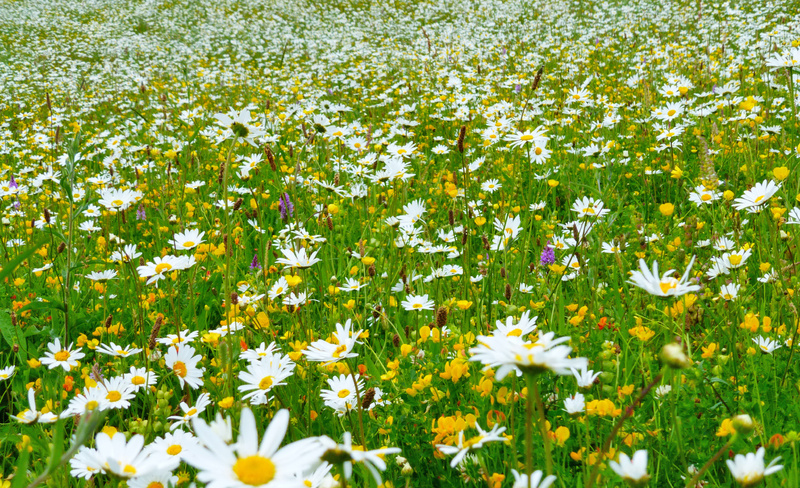 In summer this is utterly packed with colourful wildflowers and is quite a sight. 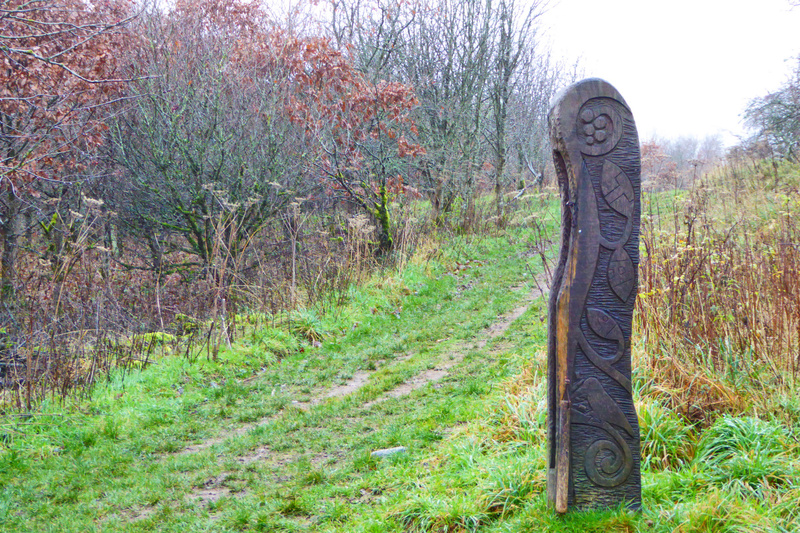 Hidden away at the top of the slope is a stone circle that, like the totem pole, depicts different Scottish animals. When the path reaches the far end of the meadow it reaches a junction next to a small burn. Cross the burn via the small bridge and then immediately afterwards turn left onto another path. As you walk along, the burn should now be on your left. The path snakes through the woods as it heads slightly downhill. At a junction beneath some overhead cables, turn left, cross a small wooden bridge and then you emerge back at the Pitcairn Centre car park.